My old apartment was in a more less dead spot for cell phone reception. The problem was especially bad when I had AT&T (now Cingular) as my provider, and somewhat less so when I switched to Verizon. You can have all the bells and whistles you want on a phone, but if it doesn't make phone calls, you can color me uninterested. In the summer, I was happy to lounge on the front porch and talk on the phone—in 0° weather, with the snow coming down, I was somewhat less happy. If you have this problem, but you're stuck with your current provider, check out the Wi-Ex zBoost cell zone signal booster. The idea's simple: place the included antenna at a spot where the reception for your phone is good (say, near a window), then attach it via the included cable to the extender. 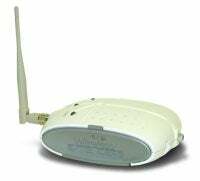 It'll create a mini cell phone zone in which you should benefit from the same reception that you do from wherever the antenna is located. And once you've positioned the antenna correctly, you shouldn't have to worry about fiddling to find the right position anymore. Wi-Ex sells three models: one that works with phones that run on a 1900MHz frequency, like Spring and T-Mobile, one that operates on 800MHz frequency used by Verizon and Cingular, and a dual mode unit that can handle either. There's also a dual-band model designed for use in cars. Unfortunately, if you're a Nextel user, you're out of luck—they don't make a compatible model at the moment.